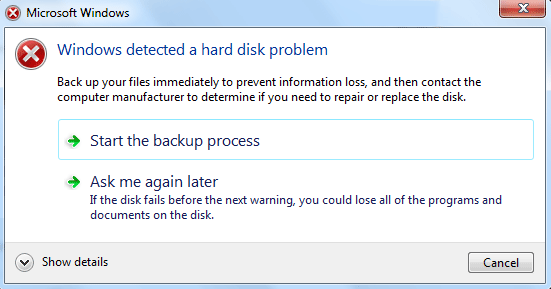 Recently I face “windows detected a hard disk problem” error message on my Windows 10 PC. The error says that your hard drive might fail soon, so backup your data to prevent any data loss. This error is usually caused due to faulty hard drive or bad sectors present on your hard drive. 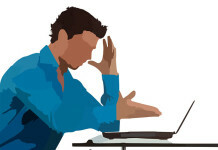 It can slow down your operating system or cause serious performance issues. The most annoying part is this error pops in every 5-10 minutes. Before we get started let’s clear out some facts. Bad sectors are actually a damaged part of the hard disk platter, which means it’s permanent and the hard disk is starting to fail. Some bad sectors can be fixed while others can’t be fixed. So the only way to permanently fix your hard drive is by replacing it. So if possible try to change your hard drive. Else you can try the below methods. System file checker (SFC) tool is used to check for corrupt or missing windows system files and restore them to their previous states. 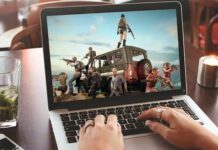 If some of your system files get corrupted then your computer might freeze or slow down, you may also face Windows have detected a hard drive error. Here’s how to fix corrupted Windows files using SFC tool. SFC is a command based tool so you need command prompt to run it. Open command prompt by searching for cmd in start menu, right click it and select run as administrator. Press enter and it will start scanning for corrupt windows files. It will automatically fix corrupt files if found any. 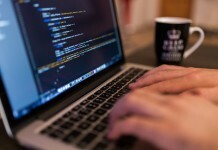 If you don’t find any corrupt files then move to the next method. 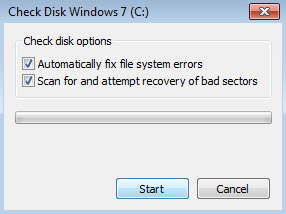 Check Disk (CHKDSK) is a utility used to find and fix errors on your hard drive. It is an inbuilt tool which comes with Windows. So to scan your PC for disk errors follow the below guide. Go to computer and right click on any of your drive which you want to check and select properties. 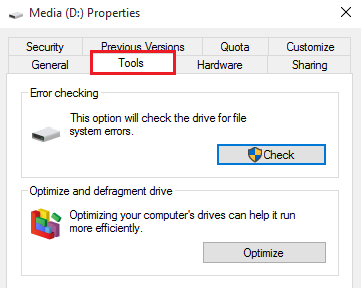 Switch to Tools tab and under error checking option click the Check button. A small window will pop up. Check both the options and click the start button. This will start scanning your hard drive for errors. If you get an error message which says Windows can’t check the disk while it’s in use. Then click on schedule disk check so that it will schedule disk checking on the next reboot. This usually happens when try to scan drives which are used by system. If you have found some disk errors and Windows is unable to fix it, then you can use some third party tools to fix disk errors. I have already covered a guide to fix bad sectors using HDD regenerator. If you have performed all the above tasks and you think your hard drive is healthy then you can disable the “windows detected a hard disk problem” error message though the local group policy editor. In the run window type gpedit.msc and press enter. Now on the L.H.S under computer configuration navigate to Administrative Templates > System > Troubleshooting and Diagnostics > Disk Diagnostics. Now on the R.H.S double click “Disc Diagnostic: Configure execution level”. Under Disc Diagnostic: Configure execution level select Disable and click on Ok. Restart your computer and windows detected a hard disk problem error won’t pop up again.